Painted Rock Academy’s largest fundraiser of the year is happening now! Friday’s Pep Rally kicked off the event, and students are now collecting pledges for the laps they will complete in the Fun Run on Friday, October 7th (usually about 30-35 laps). The goal is to raise $20,000 to provide more shade structures on campus. You can help the school by pledging, reaching out to other sponsors, and by cheering the kids on at the Fun Run. Mr. Bauer has shown his support by agreeing to participate in the Principal’s Water Balloon Challenge. 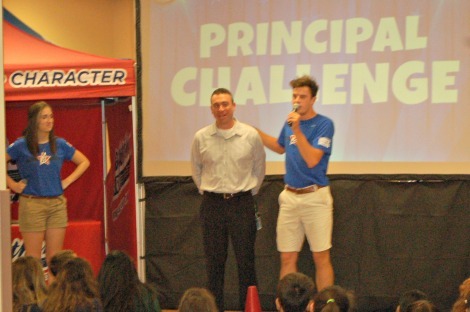 If PRA meets its $20,000 goal, 20 students will be allowed to douse him with water balloons! The 20 students will be drawn from the students who collect all their pledge money by the October 12th due date. If the goal is met, be sure to attend the November morning assembly and watch the fun! Thank you, PROP for your help in making this fundraiser a big success!